Faithfully reproduces the tachometer design of the Subaru BRZ. 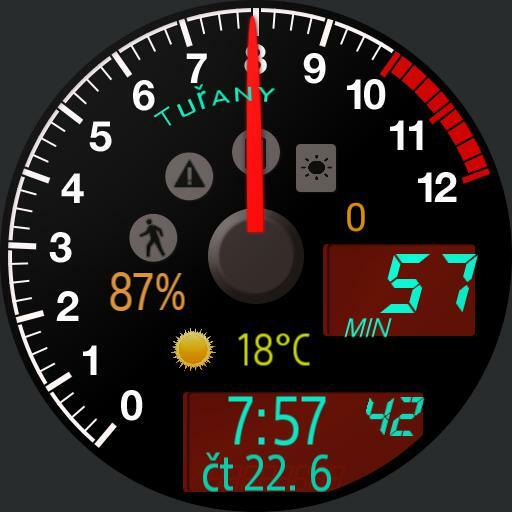 Time is indicated by the tach needle for hours and the speed display right side for minutes. White markers change to an accurate backlit red at sundown.The bottom multifunction display scrolls through 12hr time, 24hr time, TZ1, weather, step counter, chrono, calendar, and battery status modes when tapped.Status indicators light up when the stopwatch is running running man, a calendar event is active warning triangle, watch battery is low battery icon, or rainy/stormy weather is nearby weather icon. Tap any active indicator to jump directly to that function.Tap center to toggle zoom.In chrono mode, tap the millisecond display to start/stop and the running icon to restart.Special thanks to Sean Grondin for the graphical components as well as some help with the coding.